So Apple Pie Moonshine – I kept seeing photos of it, and I kept thinking about making it and finally, I made the leap. 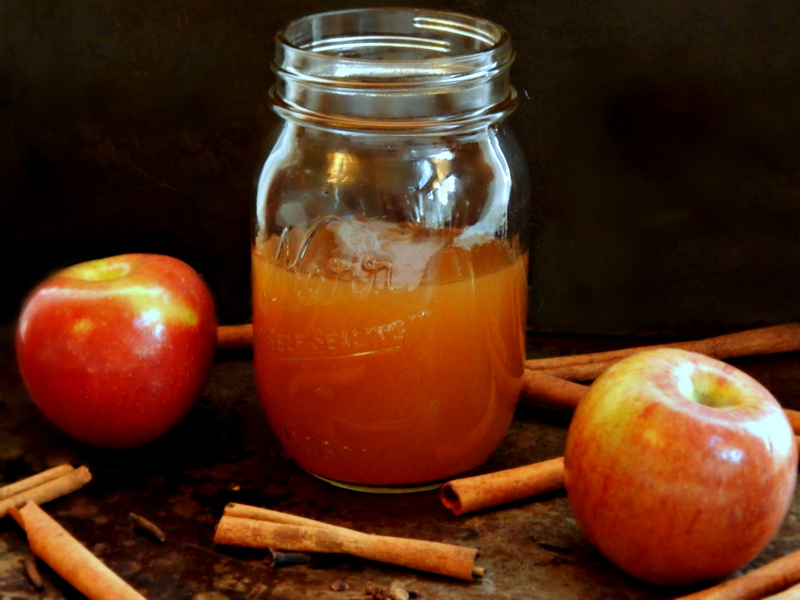 If Apple Pie Moonshine hasn’t been on your radar, read on my friend. This is a delish adult beverage that’s going to be fantastic at any fall/winter outing, tailgate or football party or bonfire or maybe even Thanksgiving or after you rake leaves, or at the cabin or on that ski or snowmobile trip. Well, serve it anytime. You get the idea! When I wanted to make my Apple Pie Moonshine, first I had to get some Everclear. Yeah, Everclear. I try to stay away from that stuff. Something to do with a Scorpions concert at Red Rocks when I was a kid. As a matter of fact, Everclear usually doesn’t even enter my head at all. But there’s no danger here because I fiddled and faddled and formulated this Apple Pie Moonshine carefully so your glassful is only going to be about 12 percent alcohol, a little more than a beer but right along the lines of a mixed cocktail. It’s a fine line. You want enough alcohol to preserve but not so much it’s gonna knock your socks off. But now that I think about it, there might still be a little danger because this stuff tastes sooooo good! I mean c’mon. The name along sings like a Siren’s song. If Apple Pie Moonshine doesn’t make you think of crisp fall nights in a moonlit wood, living just under the radar, I don’t know what would. And then there’s the Apple Pie part of Apple Pie Moonshine. You know it HAS to be good. That comes from the Spiced Rum. And cinnamon, clove, and allspice. Num! Serve over ice or slightly warm, maybe in your Slow Cooker. I did some little cocktails, too, that I didn’t take a pic of, the warm Apple Pie Moonshine in mugs with a little whipped cream and a drizzle of caramel sauce. There is one important thing to know about Apple Pie Moonshine. When it’s first made, it’s a little rough. Don’t taste it and toss it! It mellows with time. Ideally, mellow it for at least two weeks. Magic happens, if you can wait and just gets better and better! If you forget about your Apple Pie Moonshine and leave it for a couple months in the back of a dark cupboard, it’s like !x^^#$@?(****#%!!! good! By the way, if you make it this week, you can serve it to your Thanksgiving guests while everyone’s watching the game. Just sayin’. A touch of this would be great in the whipping cream on an apple or pumpkin pie! My recipe doesn’t make as much as some Apple Pie Moonshine recipes out there. I was really after a bottle for us and a bottle for a gift, and this makes a little over two quarts, but double or triple it, it’s not a big deal. It’s just as easy to make more, and next time I make this I will! In most recipes, Apple Pie Moonshine takes hours to make (admittedly that’s mostly sitting around time) and a huge pot because the apple cider is heated in order to dissolve the sugar and it has to be cooled before the hooch is added (primarily to preserve the alcohol content.) Maybe that’s not a deal breaker if you’re just making a small amount, but it’s a hassle and there’s no need for it. I’m smarter than that – we’ll just heat up a little of the cider and dissolve the sugar, then transfer it to a big pitcher or pot and dump in the remainder of the cider. Then add alcohol. Easy peasy. Easy as pie. Easy as Apple Pie, lol! So there you go: hours shaved off the prep, which might or might not matter since ideally, you’ll want this to sit around and mellow for anyway. Now some people filter their Apple Pie Moonshine and some don’t. Here’s what I found works best. Don’t initially filter, but after the mellowing process, filter it. See, it looks fine non filtered when it’s first made, and I’m all for the easy route and actually like bits and pieces in my cider but it separates and becomes very unattractive after sitting around when it’s not filtered. Even after filtering, there will likely be a bit of sediment, but a little is ok, a lot really doesn’t drink well. Filter twice through a coffee filter for best results or through cloth or cheesecloth. Heck, run it through your Britta if you want to give that a try. This is best made seasonally when the best Apple Cider is readily available but still works with plain old grocery store Cider. Sign up for email alerts from your liquor store and buy that stuff on sale. March is generally a great time to find most alcohols on sale and of course, any holidays generate great sale prices on various items. I gotta say, I was a little whoo-hoo after my sampling, lol! A little happier than normal. Which is better than being more normally than happy. I think. Cheers! In a medium saucepan, add two cups of apple cider, the sugar and spices, and heat over medium heat, stirring now and then until sugar is dissolved. Remove from heat and pour into a large pitcher. (The pitcher will need to hold more than 1/2 gallon.) Add the remainder of the cider and stir. If the cider is cold, the mixture should be cool by now so add the alcohol, if not wait until it reaches room temperature to add the alcohols. Pour into containers for storage, preferably glass, adding a piece of cinnamon, a clove and an allspice berry to each. Store for two weeks to mellow the Apple Pie Moonshine, then filter, preferably twice, through a coffee filter. If there is no coffee filter available, try a thin cloth or multiple layers of cheesecloth. Store at least two weeks in a dark, cool place; keeps indefinitely and just gets better with more time. Serve slightly warm or chilled over ice. There may be some foamy like substance floating on the top of the pitcher. It can be skimmed off if desired, but it dissolves right back into the cider in a day or so. This batch wasn’t strained initially, but later the sediment was on the bottom and was very unattractive in taste and texture. It took two straining and there was still a minute amount of sediment that settled later. This recipe comes out to a little over 12 percent alcohol, about the same as a Rum & Coke. A serving is 5 ounces. I’ll be sharing Apple Pie Moonshine on our very own Throwback Thursday Link Party as well as on Fiesta Friday. The co-hosts are Margy @ La Petite Casserole and Suzanne @ apuginthekitchen. It wouldn’t be Saturday without linking up at Saucy Saturdays blog hop! This entry was posted in Click here for Fabulous Food Posts and tagged Alcohol, apple cider, Beverages, Captain Morgan, cocktail, everclear, Rum. Bookmark the permalink. Apple pie moonshine! Looks really amazing, thanks for the recipe, and a great post! This reminds me of a trip I took to rural Oklahoma a few years ago… great memories. I’ve never been to Oklahoma, but I love travelling to rural places – maybe because I’m a “talker” and love meeting people from all over! Glad I brought up some good memories!! We are not absolutely positive – We have some invites, I may go home and also I want to do a “Fakes” Giving so I can at least cook and blog about some of our family’s favorites…. Love that “Fakes”giving! We sort of did that las Saturday–had a tableful of friends for a Thanksgiving potluck-ish dinner. People put s few spins on the meal since it wasn’t the official Thanksgiving (chipotle sweet potatoes!) — and it was great conversation into the night. Waiting to see what you come up with Mollie! hugs hugs. Well, now I’m thinking chipotle sweet potatoes! Fantastic!! Wow, Mollie this is amazing. Moonshine, I’ve heard of it but never had it this is potent and sounds delicious. Delicious fall drink Mollie! I am with you, not sure I have even thought about Everclear since my college days. Love this! I remember back in college we used to make a fake Kahlua, so I might have to see if I can modernize that old recipe a bit to use up the rest of that everclear! This is perfect for fall, though. Wonderful idea and perfect for November to take off the chill! Teresa, it was fun…we keep trying new things with it, too…when we should be letting it sit and mellow! There’s cocktails to come and a shake might be in the works! Everclear… Now there a blast from my misspent past youth! Ooooh, now I’m thirsty! It has been a while since we had something like this and my husband would really love it if I made some. It would be perfect for Thanksgiving! Hmmm, I don’t have fond memories of Everclear either, lol! I’m not a rum fan, but I’m sure cinnamon vodka might be a neat sub! I’ve seen recipes with vanilla vodka, although some of the commenters weren’t happy with it, others loved it! Really, the recipe has cinnamon, allspice and clove already so you could even use plain old vodka. Lol… did you figure out the 12% before or after the drink or two? Regardless… it sounds curiously interesting, I’d never heard of this before. Lol – during!! But I checked it twice just to make sure. 🙂 I’m a real lightweight when it comes to drinking and it doesn’t take much – plus combine alcohol and sugar and I’m bouncing off the walls. Funny thing, I’d almost rather cook or bake with booze than drink it! ok…. so I will believe your calculations, haha… I am the same… I’d much rather cook with it than drink it… just the aroma that it gives off when heated is delectable. Thanks, and I don’t know how I kept coming across it – but now I am thinking of all kinds of ways to use it – and letting it mellow, lol! Everclear used to be 95% in Iowa, but due to some alcohol poisoning cases, the government made them reduce it to 75.6%.. Not sure if this is the case in any other state, but we can’t get it at full strength. I found this out working in the pharmacy lab where we used Everclear for several compounded products. I’m sure whatever the content, this would be delish! Personally, I don’t think you can go wrong if it’s less strong, but that’s just me. Plus it tastes better with less booze, I think. 🙂 That’s so interesting that you used it in the lab. Wow! Hey, does that mean we can claim this recipe is in the interest of science?! This does sound like it would be perfect to take for Thanksgiving! We are going to some friends and I think I will make a batch this weekend…two weeks, perfect. Thanks for posting the idea. PS: My brother thinks there are some LARGE containers in their pole barn. It’s been 6 yrs since my dad passed away. It must be pretty potent by now. Oh my gosh! Wow. Amazing! That must be some property your folks left to you. I remember when you found his beans. I’m sure you still miss them both like the dickens. It’s been 6 (and 4 years) respectively, since they passed away and sometimes it’s still hard to believe that they’re gone. My brother inherited the land and he and his family live there in a house they built. At one time, my dad had plans to start a vineyard and began planting grapes. However, he and my mom were just too old to do the work required. They raised chickens for the eggs and meat and had a small truck farm from which they sold a few vegetables and fruit by the roadside. There’s even a very small greenhouse though I’ve never been inside so I have no idea what they grew in there. The pole barn was put up by my brother and my dad stored some of his things in there.